Well-planned, if unremarkable, buildings have helped create a vibrant new neighborhood. When Wells Fargo built its two office towers in Downtown East in 2016, many Twin Cities architects grumbled. The twin 18-story towers looked like suburban office parks, they said. Built to house some 5,000 employees, it was widely understood that the office towers wouldn’t have the panache (or the budget) of the 50-story Wells Fargo Center on S. 7th Street, which had been designed by starchitect Cesar Pelli. Still, some griped that the office towers should have been embellished with richer materials, like Kasota limestone. At first, I could see their point. The in-house architectural team of Ryan Cos., the lead developer and designer, could have found something more attractive than precast concrete and metal panels to detail the upper stories. But, after two years, I’ve decided that how the Wells Fargo towers look is less important than how they function in the emerging neighborhood. Because the mixed-use towers have formed such a strong connection to the buildings around them, nearby Commons park and the rest of downtown, they’ve helped Downtown East succeed. From a purely design perspective, the towers may be underwhelming. But from an urban design perspective, they’ve helped create a vibrant district and a remarkable addition to downtown. For decades, the area had been a wasteland of parking lots split off from the downtown core. But the Blue Line LRT broke through with a stop at the old Metrodome. Then, Hargreaves Associates, landscape architects for the Commons, created wider sidewalks connecting the area with City Hall. Today, the office towers, new residential buildings and the renovated Armory feel like a natural extension of downtown. 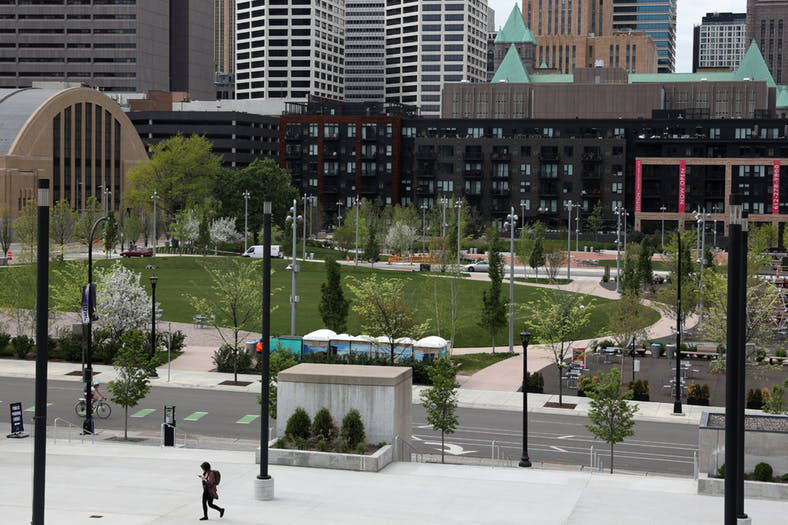 The Commons park creates two distinct outdoor rooms, a sense of openness (all too rare in downtowns) and a visual connection to the surrounding area. It may look natural, but the scale and setbacks of the buildings in the area were carefully calibrated. Former Minneapolis Mayor R.T. Rybak said he recalls walking over to the Commons many times to make sure that the Edition Residences didn’t block the view of the Armory, one of the greatest WPA buildings in the Midwest. The financial districts of most American cities become ghost towns after 6 p.m. on weeknights and remain that way on weekends. But the Wells Fargo office towers are lined with four-story apartment buildings with patios and balconies, street-level cafes and retail spaces, all of which bring people to the street and the Commons. Creating low-rise housing along sidewalks keeps eyes on the street, which builds community and discourages crime. In addition to parking, the Vikings required a skyway link to downtown. But a three-block run from the Haaf Ramp to the stadium could have been downright ugly. Instead, Ryan designed a skyway that runs through the two Wells Fargo towers. That skyway offers both interior views of the building lobbies (plus a coffee shop, sandwich shop and a convenience store), as well as dramatic exterior views of the stadium and the park. The mix of buildings in Downtown East is like a family, according to Rybak. The office towers and residential buildings work together, without trying to outshine the massive U.S. Bank Stadium. The Vikings stadium is considered one of the only truly urban football stadiums in the country. And it’s the neighborhood that grew up around the stadium that makes it possible.